Simon M, Milbeo P, Liu H, André C, Wenger E, Martinez J, Amblard M, Aubert E, Legrand B, Calmès M.
12/10-Helices constitute suitable templates that can be used to design original structures. Nevertheless, they often suffer from a weak stability in polar solvents because they exhibit a mixed hydrogen-bond network resulting in a small macrodipole. 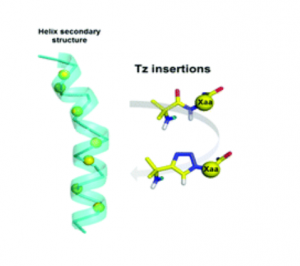 In this work, stable and functionalizable 12/10-helices were developed by alternating a highly constrained β2, 3, 3 -trisubstituted bicyclic amino acid (S)-1-aminobicyclo[2.2.2]octane-2-carboxylic acid ((S)-ABOC) and an acyclic substituted β-homologated proteinogenic amino acid (l-β3 -hAA). Based on NMR spectroscopic analysis, it was shown that such mixed β-peptides display well-defined right-handed 12/10-helices in polar, apolar, and chaotropic solvents; that are, CD3 OH, CDCl3 , and [D6 ]DMSO, respectively. The stability of the hydrogen bonds forming the C10 and C12 pseudocycles as well as the benefit provided by the use of the constrained bicyclic ABOC versus typical acyclic β-amino acids sequences when designing 12/10-helix were investigated using NH/ND NMR exchange experiments and DFT calculations in various solvents. 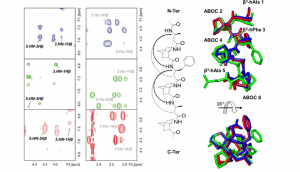 These studies showed that the β3 -hAA/(S)-ABOC helix displayed a more stable hydrogen-bond network through specific stabilization of the C10 pseudocycles involving the bridgehead NH of the ABOC bicyclic scaffold. Relying on a membrane-disturbing mechanism of action and not on any intracellular target, antimicrobial peptides (AMP) are attractive compounds to be grafted on the surface of implantable materials such as silicone catheters or titanium surgical implants. AMP sequences often display numerous reactive functions (e.g. amine, carboxylic acid) on their side chains and straightforward conjugation chemistries could lead to uncontrolled covalent grafting, random orientation, and non-homogenous density. 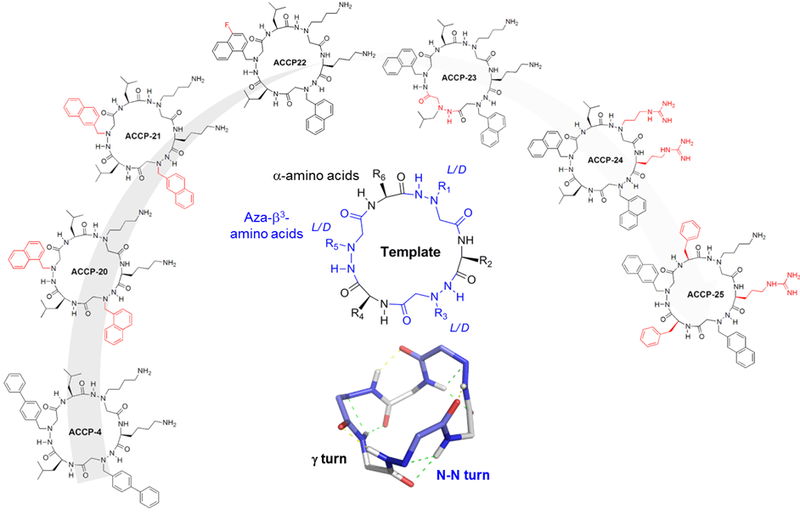 To achieve an easy and site specific covalent attachment of unprotected peptides on titanium surfaces, we designed hybrid silylated biomolecules based on the temporin-SHa amphipathic helical antimicrobial sequence. With the grafting reaction being chemoselective, we designed five analogues displaying the silane anchoring function at the N-ter, C-ter or at different positions inside the sequence to get an accurate control of the orientation. 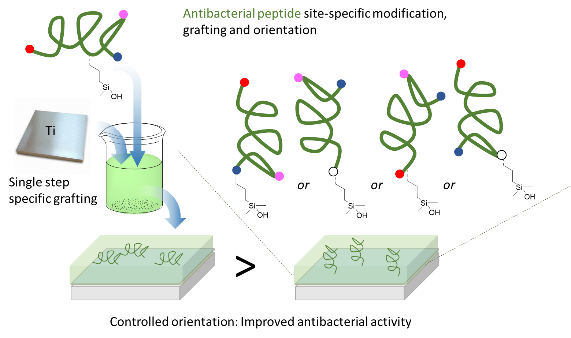 Grafting density calculations were performed by XPS and the influence of the orientation of the peptide on the surface was clearly demonstrated by the measure of antimicrobial activity. Temporin amphipathic helices are described to permeabilize the bacterial membrane by interacting in a parallel orientation with it. Our results move in the direction of this mechanism as the selective grafting of hybrid temporin 2 through a lysine placed at the center of the peptide sequence, resulted in better biofilm growth inhibition of E. coli and S. epidermis than substrates in which temporins were grafted via their C- or N-terminus. Inhibitors of kallikrein-related peptidases: An overview. Med Res Rev. 2018 Mar;38(2):655-683. doi: 10.1002/med.21451. Masurier N, Arama DP, El Amri C, Lisowski V.
Kallikrein-related peptidases (KLKs) are a family of 15 secreted serine proteases that are involved in various physiological processes. Their activities are subtly regulated by various endogenous inhibitors, ranging from metallic ions to macromolecular entities such as proteins. Furthermore, dysregulation of KLK activity has been linked to several pathologies, including cancer and skin and inflammatory diseases, explaining the numerous efforts to develop KLK-specific pharmacological inhibitors as potential therapeutic agents. In this review, we focus on the huge repertoire of KLKs inhibitors reported to date with a special emphasis on the diversity of their molecular mechanisms of inhibition. Org Lett. 2018 Jun 1;20(11):3250-3254. doi: 10.1021/acs.orglett.8b01112. Epub 2018 May 15. Ben Haj Salah K, Legrand B, Bibian M, Wenger E, Fehrentz JA, Denoyelle S.
A stereoconservative synthesis to access the triazole-fused ketopiperazine (TKP) scaffold is presented. This underexplored platform offers a wide range of structural modulations with several points of diversity and chiral centers. A series of [1,2,4]triazolo[4,3- a]piperazin-6-ones was synthesized from optically pure dipeptides. The methodology was then successfully applied to access the pyrrolo[1,2- a]triazolo[3,4- c]piperazin-6-one tricycle. Importantly, the crystal structures of representative TKPs confirmed that the configuration of the chiral centers was controlled during the synthetic route and facilitated description of the orientation of the substituents depending on their nature and position on the TKP scaffold. Damian M, Pons V, Renault P, M’Kadmi C, Delort B, Hartmann L, Kaya AI, Louet M, Gagne D, Ben Haj Salah K, Denoyelle S, Ferry G, Boutin JA, Wagner R, Fehrentz JA, Martinez J, Marie J, Floquet N, Galès C, Mary S, Hamm HE, Banères JL. IThe growth hormone secretagogue receptor (GHSR) and dopamine receptor (D2R) have been shown to oligomerize in hypothalamic neurons with a significant effect on dopamine signaling, but the molecular processes underlying this effect are still obscure. 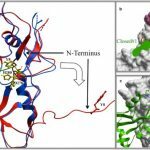 We used here the purified GHSR and D2R to establish that these two receptors assemble in a lipid environment as a tetrameric complex composed of two each of the receptors. This complex further recruits G proteins to give rise to an assembly with only two G protein trimers bound to a receptor tetramer. We further demonstrate that receptor heteromerization directly impacts on dopamine-mediated Gi protein activation by modulating the conformation of its α-subunit. Indeed, association to the purified GHSR:D2R heteromer triggers a different active conformation of Gαi that is linked to a higher rate of GTP binding and a faster dissociation from the heteromeric receptor. This is an additional mechanism to expand the repertoire of GPCR signaling modulation that could have implications for the control of dopamine signaling in normal and physiopathological conditions. As an intermediate state between liquid and solid materials, hydrogels display unique properties, opening a wide scope of applications, especially in the biomedical field. Organic hydrogels are composed of an organic network cross-linked via chemical or physical reticulation nodes. In contrast, hybrid hydrogels are defined by the coexistence of organic and inorganic moieties in water. Inorganic polymerization, i.e. the sol–gel process, is one of the main techniques leading to hybrid hydrogels. The chemoselectivity of this method proceeds through hydrolysis and condensation reactions of metal oxide moieties. 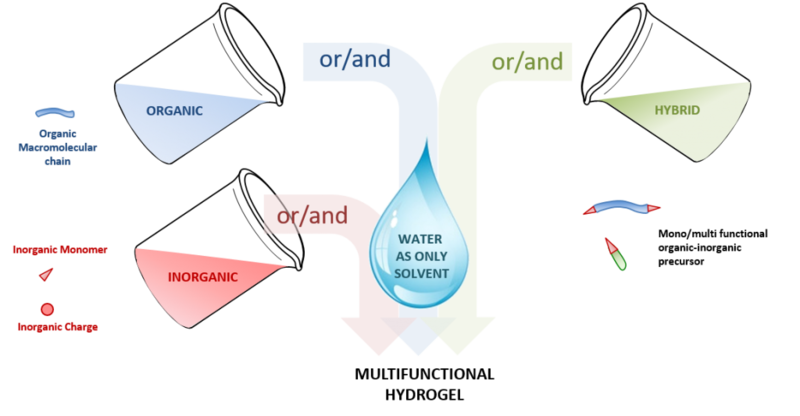 In addition, the mild reaction conditions make this process very promising for the preparation of water-containing materials and their bio-applications. Can Heterocyclic γ-Peptides Provide Polyfunctional Platforms for Synthetic Glycocluster Construction? Simon M, Ali LMA, El Cheikh K, Aguesseau J, Gary-Bobo M, Garcia M, Morère A, Maillard LT.
Sugars play key roles in many molecular and cellular communication processes involving a family of proteins named lectins. The low affinity associated with sugar recognition is generally counterbalanced by the multivalent nature of the interaction. 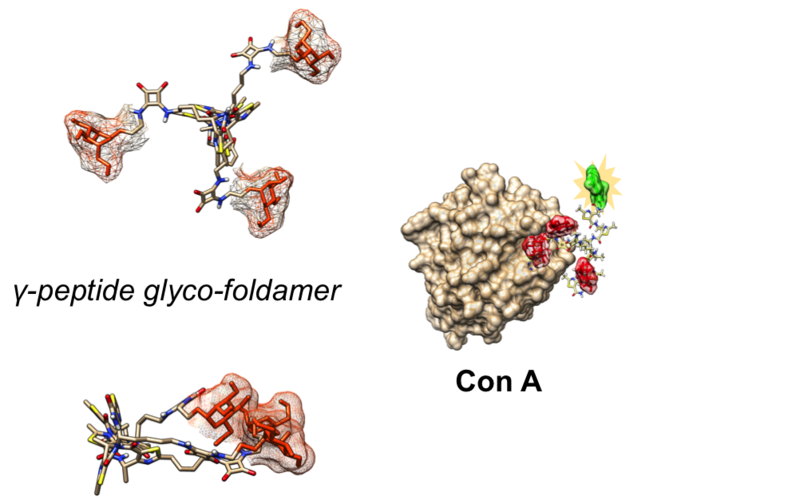 While many polyglycosylated architectures have been described, only a few studies focused on the impact of topology variations of the multivalent structures on the interaction with lectin proteins. One major interest of our group concerns the design of new highly predictable and stable molecular pseudo‐peptide architectures for therapeutic applications. In such a context, we described a class of constrained heterocyclic γ‐amino acids built around a thiazole ring, named ATCs. ATC oligomers are helical molecules resulting from the formation of a highly stable C9 hydrogen‐bonding pattern. Following our program, we herein address the potential of ATC oligomers as tunable scaffolds for the development of original multivalent glycoclusters. Chemistry. 2018 Apr 20;24(23):6191-6201. doi: 10.1002/chem.201800152. Epub 2018 Mar 26. Simon M, Laurencin M, Fleury Y, Baudy-Floc’h M, Bondon A, Legrand B. Potent and selective antimicrobial cyclic pseudopeptides (ACPPs) mixing α- and aza-β3 -amino acids were developed. Cyclopseudopeptide sequences were designed to investigate the impact of some intrinsic molecular parameters on their biological activities. Fine changes in the nature of the side chains strongly modulated the selectivity of the ACPPs with regard to hemolysis versus antimicrobial activity. The conformational preference of such compounds in various media was extensively studied, and the typical structure of cyclic α/aza-β3 -pseudopeptides is described for the first time. Interestingly, such scaffolds are stabilized by successive inverse γ- and N-N turns (hydrazino turns), a unique feature due to the aza-β3 residues. The α-amino acid side chains form a cluster on one face of the ring, while the aza-β3 -amino acid side chains are projected around the ring in the equatorial orientation. Such structural data are particularly valuable to fine-tune the bioactivity of these ACPPs by a structure-based approach. Sci Rep. 2018 Aug 3;8(1):11653. doi: 10.1038/s41598-018-29900-x. Bosc D, Vezenkov L, Bortnik S, An J, Xu J, Choutka C, Hannigan AM, Kovacic S, Loo S, Clark PGK, Chen G, Guay-Ross RN, Yang K, Dragowska WH, Zhang F, Go NE, Leung A, Honson NS, Pfeifer TA, Gleave M, Bally M, Jones SJ, Gorski SM, Young RN.